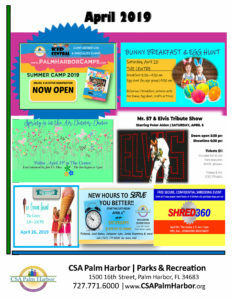 There’s always something going on at CSA Palm Harbor! Click for April 2019 flyer! LOOK BELOW and click on the event you’re interested in for more info. And, be sure to check out our Program Guide for upcoming events, classes, camps, programs and more! > Bunny Breakfast & Egg Hunt. The Centre. Saturday 4/20/19, 8:30 – 10 am. > Spring is in the Air Dinner~Dance. The Centre. $10 ticket [Advance purchase highly recommended]. Friday, 4/19/19. Dinner 5 pm Dancing 6-8pm. Entertainment by Dino. More information to come, so check our website and Facebook page for all the latest info! Come back so you can mark your calendars...see you soon! Palm Harbor Community Services Agency, Inc.
FS 119, Public Records Law. To be the recreational, cultural and gathering center of Palm Harbor and all nearby North Pinellas County communities - where locals think of first as the place to meet, play & connect. Many services showcased on the website are offered by CSA Palm Harbor's community partners. Questions? Please contact the provider. Neither CSA Palm Harbor nor any other PHCSA-related business has any direct affiliation with these organizations. Thank you. Copyright © 2019 CSA Palm Harbor. All rights reserved.